It’s been a crazy busy time in my studio, with lots and lots of deadlines to meet. But… in between it all, I have been having a lovely time with the triangle loom. Mine’s from Dewberry Ridge Looms [link] It’s a thing of beauty- so well made! I’ve been experimenting with the loom to figure out some different ways of using it. I have come up with a way of using the tri loom to weave ‘V’ shapes. It was a little challenging at first, especially since I wanted to weave a buttonhole in, as well. But, it was worth the trouble! The ‘V’ weaving technique can be used on any size triangle loom. 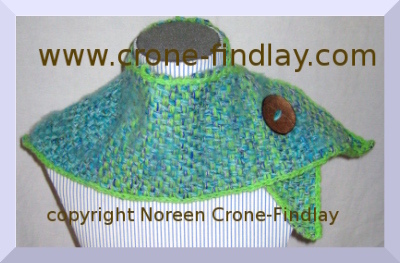 The ’V’ shape gives the cowl flexibility and drape, so it fits beautifully. My lovely daughter in law, who is a FABULOUS spinner, spun the yarn for these three cowls. I made the buttons from coconut shells. Now that we are sliding into winter, weaving coziness is a very good idea! Very ingenious, like all your little loom projects, and they look lovely! 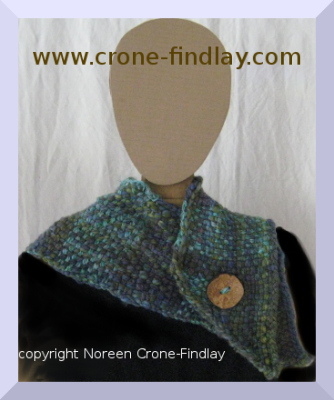 I especially like that they are made from handspun as that makes them more luxurious. Its almost enough to make me wish we had long cold winters with lots of snow – but not really! From what I have heard, you will be needing to wear these now, not when winter officially arrives next month! Keep warm and safe! They are so pretty. If I have any money left after a road trip to FL with my daughter and granddaughter I am going to try and order the set of looms. If not maybe Santa will be generous if I ask real nice. Now I am trying to decide what fiber stuff I can teach gdd on the long drive down and back. Thank you! They are sooooooooo comfortable, too! 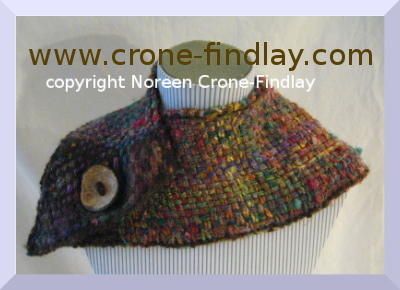 Cowls have replaced scarves for me, as they don’t drag and snag, and are lighter, and oh so cozy! I’ll be posting pics of a 7 ft shawl that I embroidered with dragonflies soon. I stitched a spool knitted cord around the outside edge and that’s just gorgeous. LOL… we are never really prepared for winter when it whumps into our lives, but having cozy cowls really does help!